The simple acts of regular movement, and regular mindfulness are scientifically proven to make us happier and healthier, more focused and productive… It’s well known that when we move, our body releases chemicals known as the happy hormones – endorphins, dopamine, and serotonin, not to mention all the other physiological benefits of movement. And there’s heaps of research to show how the practice of mindfulness – the act of simply being in the present moment, either through focused breathing, meditation or doing something that requires focused attention – induces a state of calm, and even changes the physiological structure of the brain over time. With our mission to help as many people as possible to stress less, and smile more, we believe that movement and mindfulness are two of the most powerful ways of doing this. And the beauty is that both are free and accessible to all! If it’s so simple why aren’t we prioritising the two? Modern day life has got in the way for many of us and we have become so used to the feeling of being busy and stressed that we don’t even realise what’s happening to us. We think this is normal, and we don’t know what it feels like to feel anything but this. We outsource so much now for convenience, because we are “so busy”. We use the car to nip to the shops. We take the lift or the elevator rather than stairs. We jostle for a seat on the train even though we sit for most of the day when we are at work. We are constantly looking for shortcuts to get things done or to get places. On top of that we live in this uber connected world where there is no downtime or time to relax. There’s no time away from office email, social media, Whatsapp, YouTube. We are more connected to our phones than our families and friends – it’s thought we pick up our phones 100 times on average a day… most of those mindlessly to fill time, or alleviate boredom. Technology comes with so many benefits, but with good also comes bad, and this inevitably has a knock-on effect. It’s no wonder that many of us don’t sleep well at night, because we don’t give ourselves the chance to unwind and switch off from the day. This might appear overly generalised and dramatic, but when 60-80% of GP consultations are thought to be stress related, it’s time to sit up and take action, so that we can live our happiest, and healthiest lives. And all this can change if we start with a few small steps. A simple start is to take back some of the day to dedicate to ourselves… and movement and mindfulness. We promise you will feel better as a result. Setting goals or intentions shouldn’t just be for a new year. Setting goals feeds our sense of purpose, and gives us focus, and something to aim for in life. This is good for our overall wellbeing. What’s more, according to one study 80% of us will have given up on our new year’s resolutions by February… so what better time to set a new goal and challenge? The number one resolution worldwide every year is to lose weight/get fitter. This results in swathes of people joining gyms, never to go again beyond February because other priorities take hold, and we go back to our old ways. The process of change or creating new habits is hard work. We know that the brain is wired to resist change (ultimately to protect us) so we have to work hard to retrain the brain when it comes to taking up a new practice or creating a new habit. There’s plenty of research to say that in order to create a new way of life, we need to repeat the action over and over again, and in so doing create new pathways in the brain. According to one study published in the European Journal of Social Psychology, developing a relatively simple habit takes over two months of daily repetitions to become a habit. Although the average was 66 days, there was much variation (from as little as 18 days up to as many as 254 days) between people (some people are more habit-resistant) and habits (some habits take longer to develop than others). What this research shows us, is that 100 days should be sufficient for us to pick up the habit and to turn it into a lifestyle of moving more and being more mindful each day. We say this with the caveat that if you miss a day, then that’s okay… start again the next day. Our philosophy is Better Today than Yesterday, Better Tomorrow Than Today, knowing that it won’t always go according to plan. By the end of the 100 days (11 May), we’re sure you’ll have banked enough daily practice that movement and mindfulness will become a new way of life, and you’ll feel so much better for it! We know that the act of writing down a goal makes it 50% (according to Dr Gail Matthews, Dominican University, California) more likely you’ll achieve it, and the act of sharing it with others increases that likelihood to 75%, so… if you’d like to join our challenge let us know by commenting on our Instagram post or by emailing be_well@point3wellbeing.com. And why not share it with friends and family and get them to join in too?! Let’s create a Move More Mindfully Movement! If you’d like some daily inspiration and motivation, join our Instagram group (details of how are explained on our Instagram post @Point3wellbeing) where we’ll share some daily inspo to help you on the journey. The key difference between wanting change and wanting to change is enjoying the journey and the process, rather than focusing on the end result. This can be the difference between achieving something and not. 11 Minute Challenge – Take part in our 11 Minutes HIIT+CHILL Challenge at least 3 times a week… find over 20 different challenges here. 3 Minutes is a great place to start – Listen to one of our guided mindfulness experiences on YouTube here. Every 52 minutes – Throughout the day set your timer for 52 minutes (the most productive people work for 52 minutes and then take a break), and every hour step away from your desk and do 60-120 seconds of movement: Rolling shoulders, Squats, Press-Ups, Running on the Spot etc. Little and often – Build walking into your commute, and during the day – walk the stairs, get off the bus/train a stop earlier, go and talk to a colleague rather than email or phone. Go for a walk at lunchtime. Walk to the shops rather than take the car or get a home delivery. Walkie Talkie – Find it difficult finding a meeting room? Go for a walking meeting with your boss or colleague. The act of walking and changing the scene is likely to inspire ideas and a more open conversation. Mindfulness apps – Trial one of the many mindfulness apps – we like 10% Happier or Calm. Morning ritual – Get to bed earlier, and get up earlier to build in movement and mindfulness before your day begins. Get your 10,000 – Try to restructure your day to walk as much as possible – 10,000 is the much talked about minimum amount of steps we should all be taking, and it takes conscious effort to make this happen. Write it down, tick it off – Keep a journal so that you set your intention for when your day’s movement and/or mindfulness will take place and then tick it off at the end of each day. To fail to plan is to plan to fail! Wellbeing Wednesday – Attend our free weekly workout in partnership with TRO and Richmond Borough Mind. We rotate around HIIT+CHILL and STRETCH+CHILL, every Wednesday at 6.15pm. 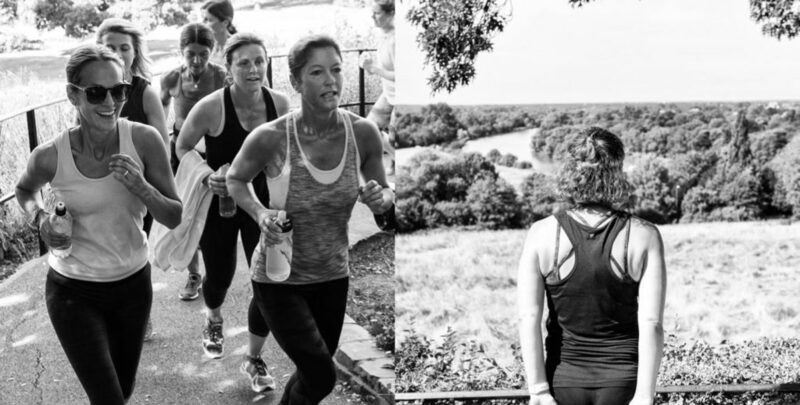 HIIT+CHILL+CHAT – Join us on the 2 March at our next mini-retreat in Richmond, dedicated to mind, body and soul, and incorporating movement and mindfulness! Our theme for this event is motivation with Megan Swanson, Just Breathe Counselling our guest speaker on the subject – what could be more appropriate? !